The glass-filled nylon frame lends strength to these featherweight thread clips weighing only 1/2 ounce. Stainless steel blades are welded into place. This model has very sharp points which are useful for pulling threads and reaching into tight spots for thread cutting. The protective cap allows safe carrying in purse, pocket, or luggage and safe stowage in your sewing basket. The cap is fitted with a loop to enable the user to attach a ribbon for hanging this indispensable tool around the neck while working. You may like these clips so much that you want more than one around your house. This is also a great item for cutting fishing line and fly-tying. Slightly thicker blades allow this scissors to be used for cutting one layer of fabric, needlework, embroidery or paper crafts. The curved, narrow blades and sharp points enable close cuts while working above the work surface. 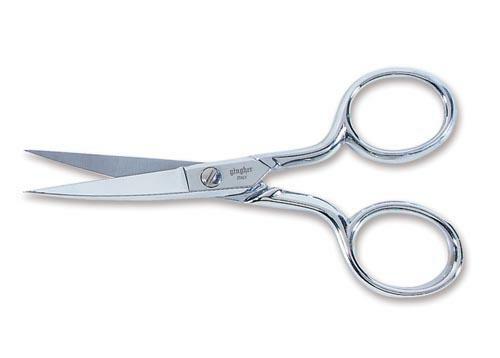 These scissors have a double-plated chrome over nickel finish. The best choice for lighter weight trimmers, strong enough to cut multiple layers of fabric smoothly. Crafted with Gingher’s tough, stainless steel blades and specially contoured black nylon handles to be comfortable for either left or right hand users. Increase tension by adjusting the nut with a wrench. The bent handle design allows a comfortable hand position working across any flat surface.